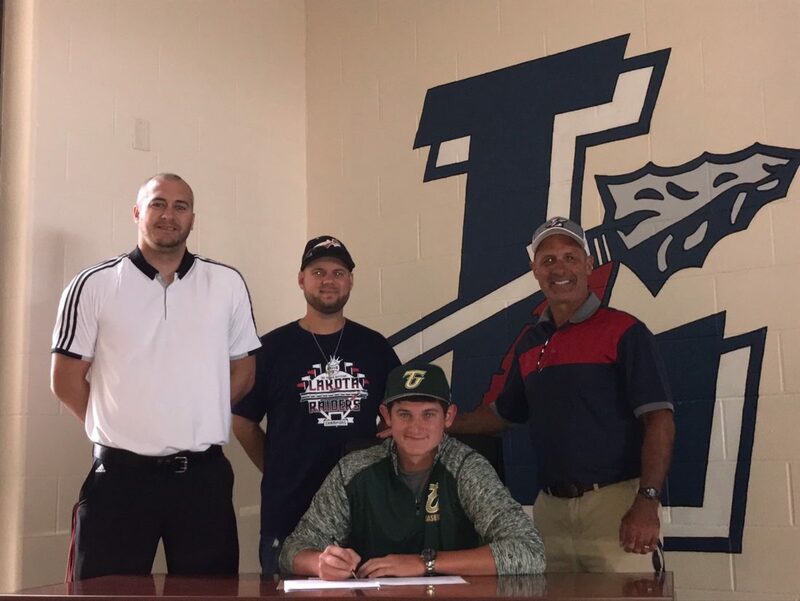 PHOTO COURTESY OF DEVIN CLARK Tyler Wehrle, a 2018 Lakota graduate signs a letter of intent Monday to play baseball at Tiffin University. Joining him are (from left) former Lakota coach Drew Linder, assistant Nate Kerr and athletic director Devin Clark in Kansas. Lakota graduate Tyler Wehrle has ties to Tiffin University. Now, Wehrle will get his chance to play for the Dragons after signing and committing to the Dragons Monday night inside Lakota High School. Prenzlin played for the Dragons from 1993-1997 and is in the school’s Hall of Fame. Family and distance from home played a big part in Wehrle’s decision. It came down to Tiffin — less than 30 minutes from home — and Malone University, located in Canton — nearly 2 1/2 hours from home. Wehrle was a part of the Raiders’ resurgence over the past two years under former coach Drew Linder, who has since taken the Clyde coaching position. Wehrle often got the ball in the biggest game situations. Lakota won a sectional championship in 2017 before capturing the Sandusky Bay Conference River division title this past season. Wehrle started when the Raiders beat Sandusky St. Mary, 1-0, in the 2017 sectional championship game, as well as when Lakota beat Liberty-Benton, 3-0, in this year’s sectional semifinal. Wehrle struck out 13 batters against Liberty-Benton. Wehrle was also on the Pemberville legion team that advanced to the state tournament this year. He started one game at the state tournament as Pemberville advanced to the quarterfinal round. Tiffin finished 16-29 last season. Wehrle will be joined by Clyde graduate Mikey Haynes with the Dragons next season.